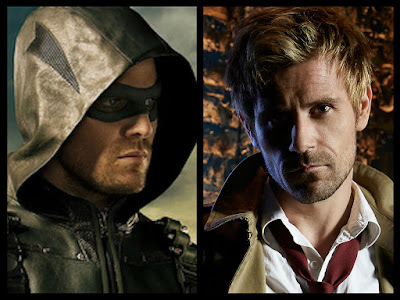 The collective squeal you may have heard Tuesday afternoon was from loyal fans after the announcement that Matt Ryan, of the cancelled NBC thriller 'Constantine,' was reprising his role for an episode of Arrow in season four. The fifth episode entitled 'Haunted' will introduce the master of the occult, John Constantine, to the world of Green Arrow. He'll be on hand to help resurrect Sara Lance before she lands on the spin-off series 'Legends of Tomorrow' as the White Canary. Despite the show's untimely ending at NBC after 13-episodes and 3 million viewers, the DC Comics adaptation spawned a loyal and socially active following. Known as "Hellblazers," fans started an online petition to save the show, lobbied other networks to pick it up and lauded Arrow's Stephen Amell's offer to appear on the show if it was saved. It was not saved and the actors were released from their contracts. Now it seems Ryan will be the one making a guest turn. He went to Twitter to address the fans after the announcement was made at CW's TCA press tour.